When you find out that Waffle Ransomware has attacked you, it is quite certain that you will lose your personal files unless you have a backup. Even if these cyber crooks offer you the decryption key at a price, there is little chance that you will get it. Most of the time such criminals simply disappear after being paid. What is even worse, they may infect you with yet another dangerous threat if you were to contact them. No wonder why we do not suggest that you do so, not to mention the fact that you would also support cybercrime by paying up. The only legitimate way for you to recover your files is to have a backup saved on a removable drive. If you have not stored a backup before, this nightmarish attack will certainly push you to do so in the future. 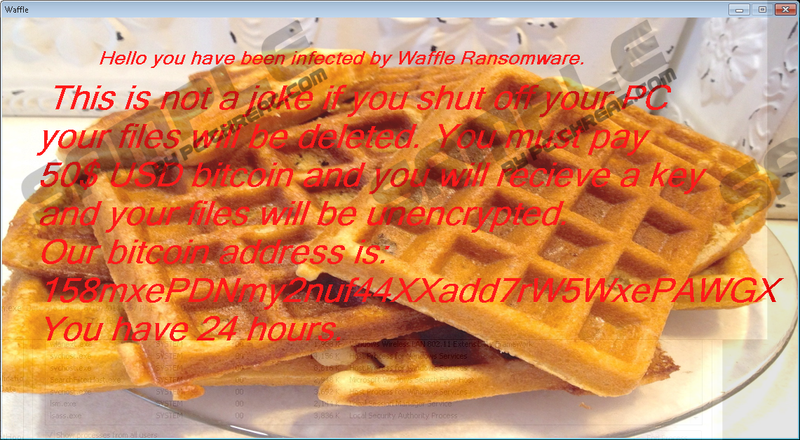 We advise you to remove Waffle Ransomware from your PC as soon as possible. Let us tell you more about this dangerous infection so that you may be able to prevent similar threats from infiltrating your system. Finding this severe threat on your machine means one thing: You have been tricked by a spam e-mail. This spam contains a file attachment that is actually the malicious executable file in disguise. Clearly, it will not appear as an .exe file with a name like "I am Waffle Ransomware.exe" or "YourFilesWillBeEncrypted.exe" either. Cyber criminals can camouflage this attachment as an image, a document, or a .zip file. In any case, when you execute this attachment, it starts up its vicious encryption process and it will be impossible for you to delete Waffle Ransomware anymore without the terrible consequence of losing them to encryption. As you can see, it is essential that you only open mails and attachments that come from known and trusted senders. This spam may claim that it is about an unsettled invoice, an unpaid parking ticket, or an issue with a hotel room booking. These matters may seem to be urgent and important enough that hardly any people could resist the temptation to check out the details. If you use these default directories to store your personal media files, there is a good chance that by now they have all been encrypted. The affected files get a ".waffle" extension that clearly indicates which ones have been encoded. After the encryption is done, this ransomware displays its ransom note window on your screen. You can easily close this window by tapping Alt+F4 or any other normal way since this infection does not lock your screen. This ransom note tells you about the unfortunate encryption of your files and that you have 24 hours to pay 50 dollars worth of Bitcoins to "158mxePDNmy2nuf44XXadd7rW5WxePAWGX" Bitcoin address if you want to get the decryption key. If you fail to do so, your key will be destroyed and you will lose the only chance to recover your files unless, of course, you have a recent backup. We do not advise you to pay any money to these cyber crooks since there is no guarantee that you will get the key at all. It is more likely, in fact, to be infected with other serious threats after contacting cyber criminals. We recommend that you remove Waffle Ransomware from your PC ASAP. Before you close this ransom note window, it is advisable to check its location by opening the Task Manager. After you kill the malicious process, you can take care of the related file. Please use our instructions below as a reference if you want to take matters into your own hands. It is possible though that you are not the manual type and you would prefer something automatic. Thus, we suggest that you employ a trustworthy malware removal program, such as SpyHunter. Of course, it is also important that you keep all your programs and drivers regularly updated if you want to avoid further cyber attacks that could exploit outdated software bugs. Launch your Task Manager by tapping Ctrl+Shift+Esc. Right-click on the malicious process and go to Properties. Read and remember the Location field so that you can find the malicious executable. While the malicious process is still selected, click End task. Quick & tested solution for Waffle Ransomware removal.